Radiotherap-e is a web-based e-learning resource produced in partnership with The Royal College of Radiologists, the Institute of Physics and Engineering in Medicine, the Society and College of Radiographers, and Health Education England e-Learning for Healthcare. Radiotherap-e offers multi-professional learning resources for the trained workforce involved in the delivery of radiotherapy, including clinical oncologists, physicists, radiographers and dosimetrists. The aim is to provide the knowledge base and practical skills training to support the implementation of advanced radiotherapy techniques in the UK. Topics covered include image interpretation and target volume delineation, dosimetry planning and optimisation, quality assurance and patient care. The sessions include a variety of media including text, images, animations, videos and assessments, as well as a number of customised tools which simulate everyday tasks in the radiotherapy process. Over the past decade, radiotherapy has seen unprecedented advances in technology and techniques, many of which incorporate new concepts and skills which may be unfamiliar to the current workforce. In 2007, the National Radiotherapy Advisory Group published a report setting out a plan to develop a world class radiotherapy service in the UK. 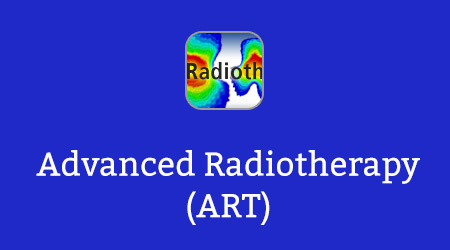 Radiotherap-e seeks to support this vision by providing online resources to support the development of the necessary knowledge and practical skills to implement advanced radiotherapy techniques safely and efficiently. Each module consists of several e-learning sessions containing informative and engaging content to interest the trained professional. The emphasis is to share the lessons learned through experience of the practical aspects of implementing advanced radiotherapy techniques, and stimulate critical thinking and discussion amongst those implementing the technique. If you already have an account with e-LfH, then you can enrol on to the Advanced Radiotherapy programme by logging in to the e-LfH Hub, selecting My Account > Enrolment and selecting the programme. You can then access the programme immediately in the My e-Learning section. The Advanced Radiotherapy programme is also available to NHS healthcare staff via the Electronic Staff Record (ESR). Accessing this e-Learning via ESR means that your completions will transfer with you throughout your NHS career. In the event that you do not qualify for free access to the Advanced Radiotherapy programme, you are able to license access through eIntegrity, a community-interest company established for this purpose. For more information on the licensing options available for the Advanced Radiotherapy programme, please visit the eIntegrity website.